La Casa (in Spanish means - The House) is converted from an erstwhile residential mansion of a large Indian joint family. Hotel La Casa is a deluxe luxury hotel in Haridwar which offers comfortable and memorable stay. Lounge sit-outs on each level have been designed to enhance your holiday experience, massaging machines, library of handpicked books, and soft piped music will unwind you completely. 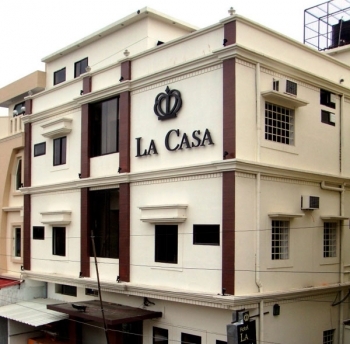 Hotel La Casa is located in the center of the mystical city of Haridwar, which means that you can walk out of the hotel at any time of the day (or night) and catch the serenity and uniqueness of the city without bothering about the transport or feeling insecure. The location of the hotel is at the intersection of the 3 most important approach roads to Haridwar. Thus, when during the festive occasions, most of the roads are transport sealed; our hotel can still be reached in your private vehicle or hired taxi. Casa Standard: A-perfect-for-couple-room, Casa Standard is a cozy and warm-lit inviting room, which offers all modern amenities including Slim LCD TV’s and en-suite modern bathroom. Casa Royal: Grand and Majestic, this king-sized room has a luxurious comfy bed, traditional furniture, vibrant walls painted with rich gold-colored motifs, along with all modern comforts and amenities. Hotel La Casa has an indoor restaurant and a dining hall which serves delicious multi cusines. The hotel La Casa in Haridwar is easily accessible by Road. The hotel is just 200 kms from Delhi, 80 Kms from Mussoorie, 50 Kms from Dehradun, 20 Kms from Rishikesh. Railway station is just 1 kms from hotel and nearest airport Jolly Grant is 30 kms.